We have a 10 year-old niece that loves Halloween so much that she always starts thinking about her costume at the end of summer vacation and right before she goes back to school. Because of this, we all have to participate and end up making a big deal about this holiday. We decorate our house with spooky ghosts, snakes and spiders and I even like to make a graveyard in our front yard with lame Styrofoam tombstones and flying ghosts that hang from the tree we have out front. So, of course, making all kinds Halloween treats in our house is also a must during this time of year. 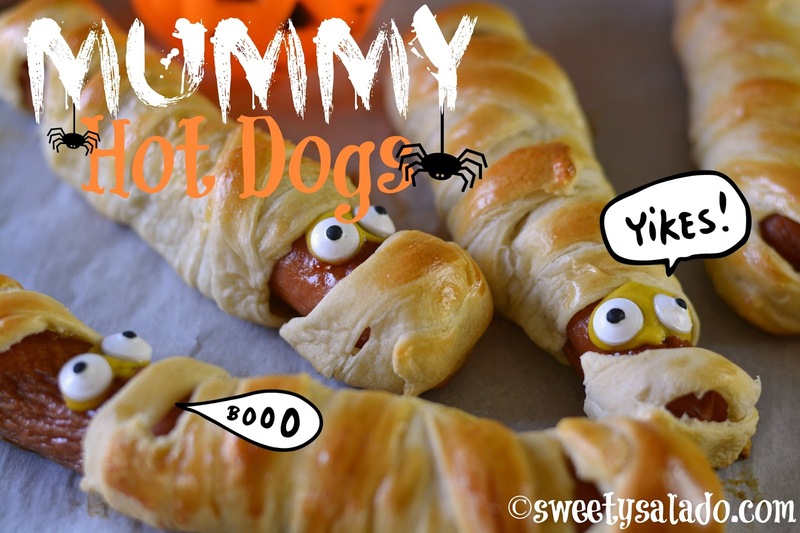 Like these hot dog mummies that are super popular all over Pinterest for a reason, because they’re delicious and super easy to make. You can use whatever kind of dough that you like. I’m using a refrigerated crescent dough sheet, but you can also use refrigerated pizza dough, bread sticks dough and even the dough recipe I have for making Colombian cheese sticks in this blog. 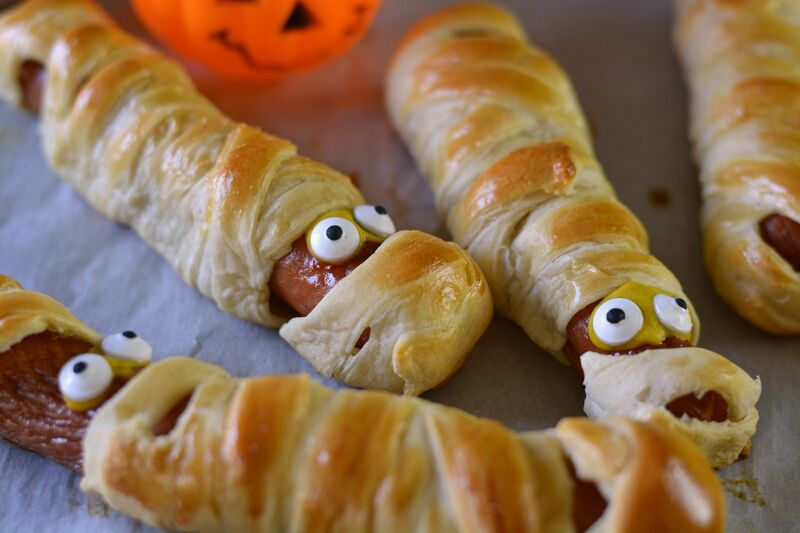 You can also decorate these hot dog mummies whichever way you want. Most people use mustard or ketchup with a couple of black sesame seeds to make the eyes but I found some candy googly eyes that make them look just perfect and incredibly cute. Unroll dough and flatten it with a rolling pin to make it even. If you're using crescent roll dough, make sure to pinch the seams together to make it into a solid rectangle. If you're making your own dough, shape it into a 10 x 15 inch (25.4 cm x 38.1 cm) rectangle. Cut the dough into strips using a sharp knife or a pizza cutter. You will need a total of 2 strips per hot dog. If you're making 8 hot dogs, cut the rectangle into 16 strips. If making 10 hot dogs, cut it into 20 strips. Start wrapping each hot dog with one strip of dough starting at one end to form the head of the mummy, leave room for the face and keep wrapping it until you reach the other end. 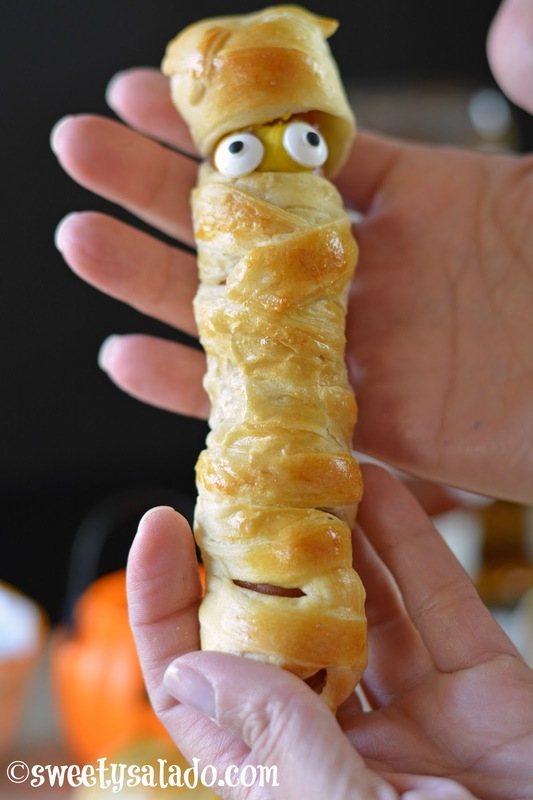 Wrap it again with a second strip of dough starting at the bottom of the mummy. Before you reach the end of the strip, pinch off about an inch of dough and place it over the head to cover any gaps it may have. Brush each mummy with the beaten egg and bake for about 13-15 minutes or until golden brown. Place two drops of mustard or ketchup on the face of the hot dogs to make the eyes. You can also place a couple of candy eyes on top to make the eyes bigger. Serve with ketchup and mustard or any fast food dipping sauce.